Juan M. Marti LV, Cert SAO, MVM, DipACVS, DipECVS, MRCVS. 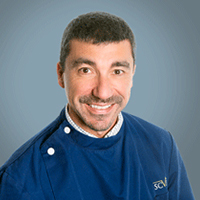 Juan graduated from Glasgow Veterinary School in 1990, where he also achieved a Master in Veterinary Medicine and a Certificate in Small Animal Orthopedics. After a year in private practice in London, he moved to North Carolina Veterinary School for his surgical residency, taught at Mississippi and Ohio Veterinary Schools for another four years and then moved to Virginia, where he became a partner in a busy multispecialty referral veterinary hospital. Marti, J. M. (1992). Open wound healing and its management. Veterinary Nursing, 7, 3, 88-92. Marti, J. M., Miller, A. (1994). Delimitation of safe, hazardous and unsafe corridors for the insertion of external fixator pins in the dog. 1: Hindlimb. Journal of Small Animal Practice 35, 16-23. Marti, J. M., Miller, A. (1994). Delimitation of safe, hazardous and unsafe corridors for insertion of external fixator pins in the dog. 2: Forelimb. Journal of Small Animal Practice 35, 78-85. Chico, A.C., Marti, J. M., Durall, N., Menes, I. (1995). Sarcoma sinovial en el perro: dos casos clínicos. [Synovial sarcoma in the dog: two cases]. Clínica Veterinaria de Pequeños Animales 15, 52-56. Marti, J. M. (1995). What is your diagnosis?. Journal of Small Animal Practice, 36, 294 and 230. Marti, J. M. (1995). Synovial fluid analysis in the dog. Veterinary Nursing 10, 12-15. Marti, J. M., Wells, K. (1996). Jejunal rupture associated with traumatic pubic symphysial separation in a dog. Veterinary and Comparative Orthopaedics and Traumatology 4, 179-181. Marti, J. M. , Altimira, J., Chico, A.C. (1996). Hemangiosarcoma esplénico con metástasis óseas: descripción de un caso y revisión de diversos aspectos clínicos. [Splenic hemangiosarcoma with osseous metastasis: one case and clinical review]. Clínica Veterinaria de Pequeños Animales AVEPA, Vol 16, 2, 118-122. Marti, J. M. (1997). Bilateral pigmented villonodular synovitis in a dog. Journal of Small Animal Practice, 38, 256-260. Marti, J. M. (1998).Aspectos mecánicos y biológicos de la interfase clavo-hueso en fijación externa. ¿ Porqué se sueltan mis clavos?. (Mechanic and biologic aspects of the pin-bone interfase in external skeletal fixation. Why do my pins get loose?) Clínica Veterinaria de Pequeños Animales, 18 (1), 44-52. Marti, J. M., Roe, S.C (1998). Biomechanical comparison of the trocar tip point and the hollow ground tip point for smooth external skeletal fixator pins. Vet Surg 27 (5), 423-428. Stamper, M.A., Norton, T., Spodnick, G., Marti, J. M., Loomis, M. (1999). Hypospadias in a polar bear (Ursus maritimus). Journal of Zoo and Wildlife Medicine, Vol 30 (1), 141-144. Marti, J. M., Roe, S.C. (1999). An in vitro comparison of hollow ground and trocar points on threaded positive-profile external skeletal fixation pins in canine cadaveric bone. Vet Surg (28), 279-286. Marti, J. M., Marcellin-Little, D.J, Roe, S.C. (1999). Use of a DeVita pin to maintain reduction of a dislocated total hip prosthesis in a dog. Veterinary and Comparative Orthopaedics and Traumatology (12), 85-87. Marti, J.M. (1999). Opciones quirúrgicas en la reparación de fracturas femorales conminutas en el perro. (Surgical options in the repair of comminuted femoral fractures in the dog). Clínica Veterinaria de Pequeños Animales (19), 3, 181-187. Marti, J. M. (2000). Fijadores externos en las fracturas del miembro anterior. (External fixation in fractures of the forelimb). Consulta (8), 68, 39-45. Marti, J. M. (2000) Guided bone regeneration in the treatment of a compound odontoma in a dog. Veterinary and Comparative Orthopedics and Traumatology(13), page 204-207. Marti, J. M. (2000). La asepsia en cirugia veterinaria (Asepsis in veterinary surgery). Argos (19), 14-15. (non peer- reviewed journal). Marti, J. M. (2000). La telemedicina en medicina veterinaria. (Telemedicine in veterinary medicine). Argos (18), 6. (non peer-reviewed journal). Chico A.C., Font J., Marti J. M. (2001). Trochlear femoral fractures in cats: result of seven cases. Veterinary and Comparative Orthopedics and Traumatology (14), 51-55. Marti, J. M. (2001) Fracturas mandibulares en el perro (Mandibular fractures in the dog). Consulta (80), 59-66. Marti, J. M. (2002). El uso de los expansores tisulares en cirugia reconstructiva: descripcion de un caso clinico y revision de literatura (The use of skin expanders in reconstructive surgery: description of one clinical case and literature review). Clínica Veterinaria de Pequeños Animales 22, 3, 231-236. Marti, J. M. (2002). El sindrome de la espondilomielopatia caudal cervical en el perro: su diagnostico y tratamiento. Clinica Veterinaria de Pequeños Animales (AVEPA), vol. 22, 209-213. Chico, A.C., Marti, J. M. (2003). Femoral throclear osteochondrosis in two siblings, Veterinary and Comparative Orthopedics and Traumatology (16), 200- 205. Regular contributor to CONSULTA journal (Spanish, non-peer reviewed, for practicioners): 4-5 case reports per year, based on real small animal orthopedics and soft tissue surgery clinical cases. Chapters on Pelvic fractures and Growth deformities. In Secrets of Small Animal Surgery, by Dr. J Harari and other contributors. Elsevier Inc (ed). 2000. Common surgical techniques in small animal spinal surgery. In Manual practico de Neurologia Veterinaria (Practical Manual of Veterinary Neurology), by Dr. Juan J. Minguez and other contributors, ECVN resident . Servet (ed). March 2015.